Wall spikes also called razor spikes have a bit like a cactus whose body with a sharp spikes. Our wall spikes are made out of plastic, stainless steel wire, aluminum wire and galvanized steel strip. It is weather resistant and extremely durable. 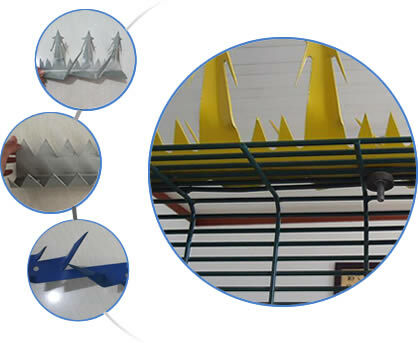 We concentrate on spikes of various forms, such as castle wall spikes, bird spikes, shark tooth wall spike, anti climb spikes and security spikes. Roller and rotating style in different colors also is offered. These spike system are a simple and effective solution enhancing the security of an existing wall or security fence, or for gutter. 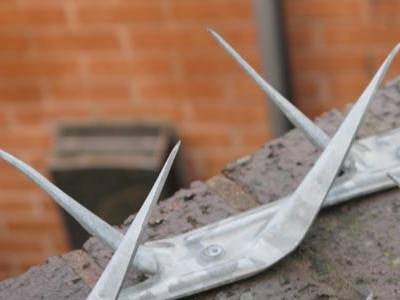 In them, stainless and galvanized anti climb wall spikes are designed to work for security fences, castle wall spikes is the strongest one on the market as well as shark spikes. 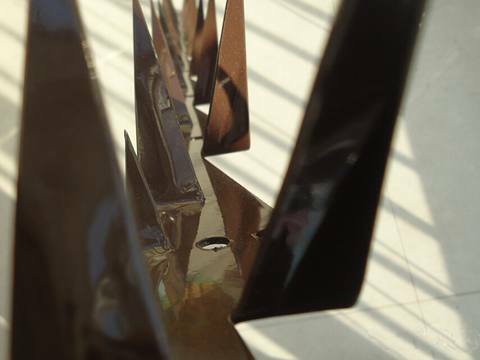 Our wall spikes are easy to install and come in a variety of coatings or finishes. They are strong and can not be broken off the wall easily, not only from the mounting but the spikes themselves. Anti-climb fixed and rotary spike barriers is also available in Anlide. Our galvanized rotary spike with minimum height 220 mm and galvanized fixed spikes with minimum height 64 mm, barb thickness 0.5–2.5 mm. Xingying International also supplies wall spike fence system, which can be rapidly installed on top of existing structures (wire mesh fence or concrete wall fence, gates and other surfaces) to maximize your fence security. Our security fence spikes with barb length 64–100 mm, barb thickness 0.8–2.0 mm, length of per piece 0.5–2 m. Palisade fences, razor wire and barbed wire are also available in our factory. 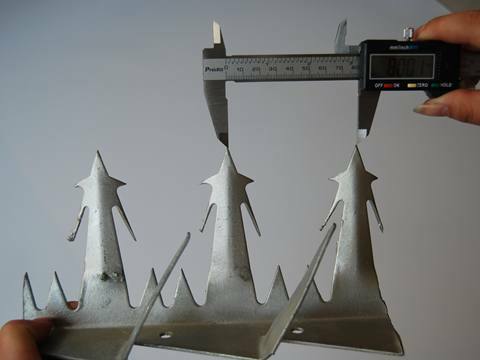 Different specifications of wall spikes and other products can be customized according to customer requirements. Our razor spikes also used in the installation of domestic and commercial air conditioning systems. Wall spike strips installed on air conditioning can avoid bird set his nest on the air conditioning, which can affect the performance of air conditioning. Our factory uses quality materials and the whole processing under quality control. Our wall spike products can meet the technical requirement of the USA and European countries, and it is popular with these countries. If you have any requirements, please e-mail us sales@wall-spikes.com. Rotating star spikes and wall spike security system for gates and chain link fence extra security. Plastic roller wall spikes in green, brown, white and gray color mounted on top of concrete wall or brick wall for property. Flexible plastic wall spikes strips in brown mounted on top of a slide gate, and cactus type plastic wall spikes cover backyard wall. Black roller spikes and rotating wall spikes for security in a nuclear power plant. Rotary security spikes with inter brackets and corner bracket add security gate. Hot-dipped galvanized steel anti climb spike comes in lengths of 1 feet and 4 feet, is 35–45 mm wide at the base, spikes stand 80 mm high, 1.5–2 mm thick. Powder black steel wall spike set, that looks like a single heavy nail sticking straight up about every 1 inch, for wood privacy fence. Plastic brown cactus wall spikes mounted on some existing gates for intrusion deterrent. Flat cactus wall spikes in green and the transparent curved strips to cover 1200 linear feet of masonry wall. Stainless steel wall spikes (with weather proof and resistant to rust corrosion) put on roof edge to keep pigeons off roofs in ocean condition. Galvanized razor wire BTO-28 / 700 mm / 5 clips / 8 m length. Black powder coated anti-climb wall spikes for residential fencing, and razor barb wire around the existing parameter fencing. Galvanized castle wall spikes 1.8 m lengths, large spikes on one side and small spikes on the other side with predrilled holes. 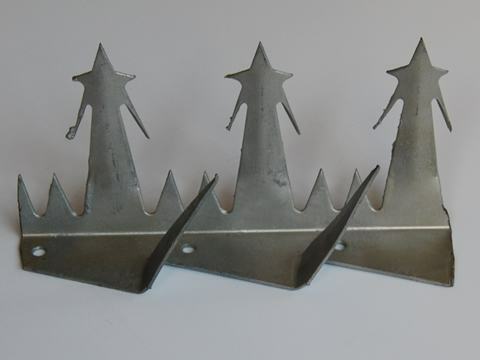 Castle wall spikes in galvanized black required for garden wall anti-intruder application. High security shark tooth wall spike fence, for block boundary wall and guard wall. Awesome products at a low cost. I purchased these for a safe problem at my son's apartment. His house is facing the street. Some people are always jumping the wooden fence and breaking into the home. The anti climb wall spikes is really useful. Besides, the product is really easy to install and low cost. Looking for metal wall spikes for my back yard fence line, one–to keep my feline in our yard, two–to keep burglars out. The noise and droppings are unacceptable. With the help of sale experts, I ordered 60 feet black PVC coated wall pikes. It is stop the animals going into the yard as well as stop anyone who attempt to cross the fence. I am inquiring spikes to suit a corrugated fence to prevent the cats and possums to intrude and climb the fence at night. They are always making my garden in a mess. At last, I choose the small size stainless steel and color coated wall spikes. Because I don't want to make it look obviously. It is really effective! Rotary anti climb spike protect my yard well! I just moved in a new house and I went out early and came home late. I closed my gate and every morning it is wide open. Some nights when I am sitting late night in my back yard I have seen men attempt to climb my brick wall to enter my yard. I want to protect my family and my home. I just had security alarm installed but i want the wall climbing to stop. I choose the rotary anti climb spike barrier. It is very good! The barbed wire makes me feel safe and secured inside my home. I have to put this around my home because of the series of crimes in our neighborhood. Thanks to this product! I can now sleep safe and sound. Very nice quality, very heavy duty anti climb wall spikes come with the screws! I used marine grade stainless steel wall spikes (marine grade so it will not rust) installed around a pool and mounted on a chain link metal fence. The top of the fence is 1-1/4 inch. It is just what I was looking for! And the price was good. In all, I'm satisfied. The barbed wire and wall spike were great to enhance the security of my house installed on top of a tennis court fence. They are clean looking, sustainable don't get rusted easily. I highly recommend them. We a security company in Egypt. Installed spike fencing on my electric fence in a big project, perfect products. We got your plastic wall spikes (ones shaped like little cones) for the top of our retaining wall that outlines our backyard to keep skunks and possums out. It is an effective treatment for keeping these pesky critters out.